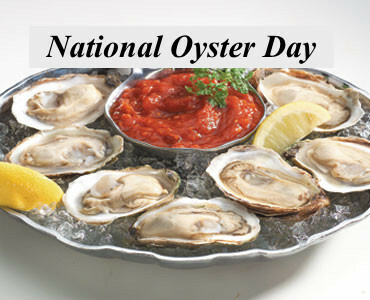 Americans eat more oysters than any other country in the world. The world’s only oyster museum is on Chincoteague Island, Virginia. 1850 Henry-Rene-Albert-Guy de Maupassant was born. Among the subjects of his short stories are many about the fashionable life of Paris. 1858 Alexis Benoit Soyer died. French chef and author. Chef of the London Reform Club. He opened kitchens in Ireland during the famine to sell food at 1/2 price and was an advisor on food to the British army during the Crimean War. Invented several stoves and kitchen utensils. Wrote ‘The Pantropheon; or, History of Food’ (1853), ‘A Shilling Cookery Book for the People’ (1854), ‘Soyer’s Charitable Cookery’ (1847). 1914 The first electric traffic lights were installed in Cleveland, Ohio at Euclid Ave and East 105th Street. 1962 Marilyn Monroe died. American actress, primarily remembered as being crowned Artichoke Queen of 1947 in Castroville, California. 2008 IBM is granted a patent for storing a customers preference for ‘paper or plastic bags’ on the stores customer loyalty card. Does this really deserve a patent?! Our patent system is definitely out of control.